Factual errors: In the film, the year is 2006 and it is the Festival of Sacrifices (Kurban Bayrami), a religious holiday. Everybody is in summer clothes and many of them are sweating. The Festival of Sacrifices in 2006 in Turkey was in winter, at the end of December. Yeter: And what did he say? 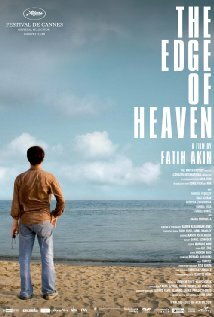 "The Edge of Heaven", original title "On the other side", takes up a number of ideas from Faith Akin's previous film. But it takes them also in a new unexpected direction - with a political view (on Kurdish problem, on Europeans), with additional protagonist types - now the conflicted German Turks are joined by 'naive' Germans proper and 'seen-too-much' Turkish (Kurds) proper. All of the characters were very well constructed and, as representative types of their social groups, offered much material for the audience to reflect upon. Still, the myriad political and social themes are only a setting to a much more personal story. The opening of one's soul, the crossing of inner walls that separate us from those who love us. This story is repeated three times, in different context, for the three characters who remain alive to cross 'to the other side': the German mother who accepts her daughter's ideals, the German-Turkish son who forgives his father, the Kurdish girl who takes the love of her friends over her revolutionary commitment. However, the director allows no one of them to consume their redemption within the film's running time - their characters remain tragic. It is a very powerful film. As a friend said after the screening, it tramples over you like a steam-roller. The emotional mix of the previous film "Head-on" had me cry, but crying releases the pain. This one doesn't let to release the tension even at the final scene. It will stay with you for days after.